Afghanistan looks set for another year of record opium production in 2017, maintaining its role as the world’s biggest producer. As opium production has grown, the Taliban has assumed a bigger role in it, deriving much of its income from the drug trade. As the Taliban relies more and more on drugs, many of its fighters are less likely to accept reconciliation with the US-backed government. Afghanistan has long been one of the world’s biggest producers of opium, which is used to make heroin, and the Taliban has made a lucrative business from taxing and providing security to producers and smugglers in the region. The country has produced the majority of the world’s opium for some time, despite billions of dollars spent by the US to fight it during the 16-year-long war there. Afghan and Western officials now say that rather than getting smuggled out of Afghanistan in the form of opium syrup, at least half of the crop is getting processed domestically, before leaving the country as morphine or heroin. An Afghan farmer can be paid about $US163 for a kilo of raw opium, which is like a black sap. Once it is refined into heroin, it can be sold for $US2,300 to $US3,500 a kilo at regional markets. In Europe it has a wholesale value of about $US45,000. “This trend has real consequences for peace and security in Afghanistan, as it encourages those within the Taliban movement who have the greatest economic incentives to oppose any meaningful process of reconciliation with the new government,” the UN has said. The Taliban’s move into heroin processing comes as it gains ground against the government, particularly in areas where the drug is produced. UN Office on Drugs and CrimeThe Southern and Western regions of Afghanistan were home to much of the country’s opium-poppy production in 2016. Helmand, home to an estimated 80% of Afghanistan’s opium poppies, is a “big drug factory,” a Western official told AFP earlier this year. “Helmand is all about drugs, poppy and Taliban,” he said. UN World Drug Report 2016In 2015, the global opiate market appeared to be stable despite important regional changes. 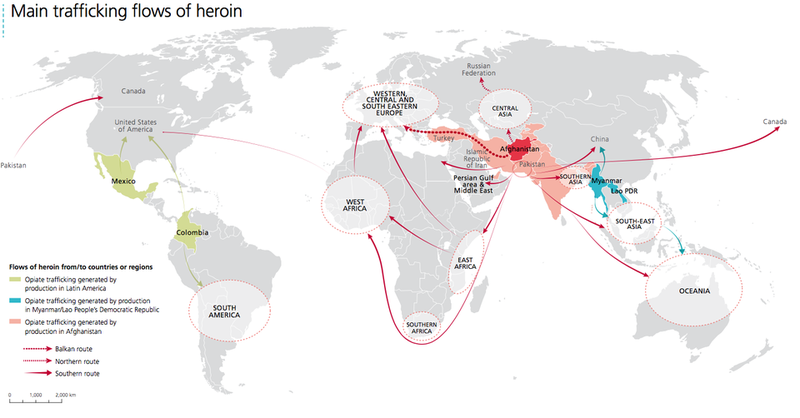 Heroin is Europe’s most common opioid, with an estimated retail value between 6 billion and 7.8 billion euros, according to the report, produced by the European Monitoring Center for Drugs and Drug Addiction.